Goldsmith was writing after the enclosures, when landowners set about dispossessing rural communities of their livelihood, setting in train a chain of events that has impoverished so much of rural England since. Many villages around England and all over Europe, steeped in history and tradition, private family myths and public claims to fame, have suffered the same slow blight. Population drift to cities – caused by the sort of actions by landowners that Goldsmith is referring to – a lack of young people and a consequent lack of investment; a cycle hard to be broken. But Youlgrave has fought back and is far from deserted. Not long ago, Youlgreave Village Shop was a butchers and in need of serious repair. Now, it is a lively trading post in the heart of this beautiful White Peak village. Youlgreave itself has a number of businesses and a thriving village hall, which i know from Klezmer Weekends. While, The Action with Communities in Rural England put a lot of emphasis on Village Halls and have done some great work with Village Hall Networks, a shop can act as a second hall – for meetings – there is a mum and baby group – chat and networking. When meeting Lisa to discuss how we can work together to make our businesses more successful, it was with awe at her bravery but maybe a bit of a raised eyebrow at the amount of work and financial investment the new look shop represents. How much air has she in her lungs to resuscitate the shop? Well, it turns out she has loads! She told me how they bought the shop in October 2016 and its tumbledown state, the work commenced on December 5th last year and they opened in June 2017. A tight timescale by any standards. And they now have a space that teams with wonderful local quality products on the shelves (a really god flour range from Caldwells Mill, by the way, for you bakers out there) , a welcome cafe for walkers and cyclists and locals, and , as Lisa points out, a place for sustaining community. 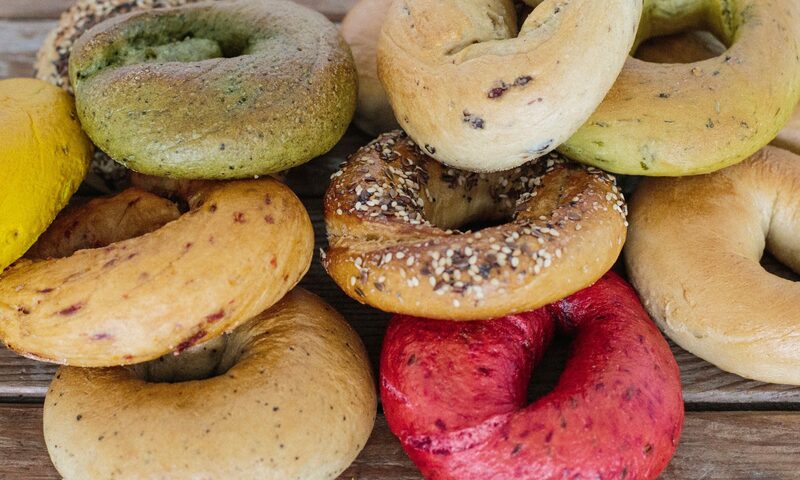 And of course, let’s not forget, they also have bagels. So, Sheffield and Chesterfield cyclists and walkers, make sure you stop by if you are having a day out in the White Peak.